It was probably the quote of the day when the World Singlespeed Mountainbike Championships were decided for 2010. Race director Dean Watson said it perched in a cherrypicker while more than 850 one-geared and free spirited cyclists circled him moments before the first ever New Zealand hosted race started. It was an amazing scene with the riders about to take part in the biggest rolling fancy dress party of their lives. It was somewhat spiritual. The riders were trancelike, the house-type music adding to their focus as Watson sent them away onto the world famous Rotorua mountainbike trails. This has to be the only world championship in the world where Muppets and superheroes can line up with cycling stars. At one end of the event were the racers, primed and ready to hurt themselves for the chance to be crowned world champion. But the majority, including New Zealand’s road cyclist Julian Dean, were there for fun, fun, fun. The Waihi-born professional roadie who lives in Rotorua when not in Europe had been a late entry, talked into going off road by Dale Hollows: legendary spanner to several Kiwi cycling stars. 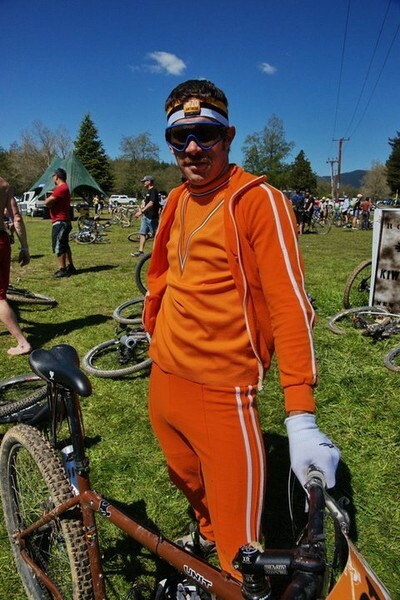 Dressed in a splendid orange tracksuit Dean looked a cross between an 80s sports star and movie character Dirk Diggler. It was the perfect disguise to walk up the hills and partake in the odd beer shortcut. “This is my track suit … I thought it might be a goody but there are some pretty good costumes here,” laughed Dean, admitting he’d re-claimed the threads from his parents in time for his second world championships of October. “Obviously there are some people here that want to win but most of the people just want to have fun - it’s good to be part of something that’s so relaxed,” said the New Zealand representative at the recent World Road Championships. Like many of the 850 plus starters in Rotorua, Dean loved his first single speed experience with family and friends.